It's high time that I introduce you to Erin, the sweet creator of Simply Just Lovely. She's also one of our sponsors this month! Erin blogs about personal style, the world of fashion, love, her feelings on motherhood and so much more! Come say hi and join her on my journey as she shares a glimpse of her life and inspirations! Please tell us about yourself, Erin. I am a new momma to a handsome little boy named Aidan. By day I am a fashion teacher and in my spare time, which is limited these days, I create, design, and craft. I live a creative lifestyle and would have it no other way! Fashion is what initially inspired me to start my blog! I have an obsession with all things fashion so I decided to start documenting my style and share with others what inspired the way I dressed. My blog has since transformed into a journey of my life and what inspires me on a daily basis. 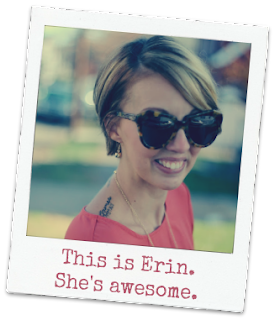 Erin has also graciously decided to be a part of this month's giveaway! She's giving one lucky winner a $10 credit to her Etsy store, Simply Just Lovely. Make sure to check back on February 25th for the Fantastic February Sponsors Giveaway!